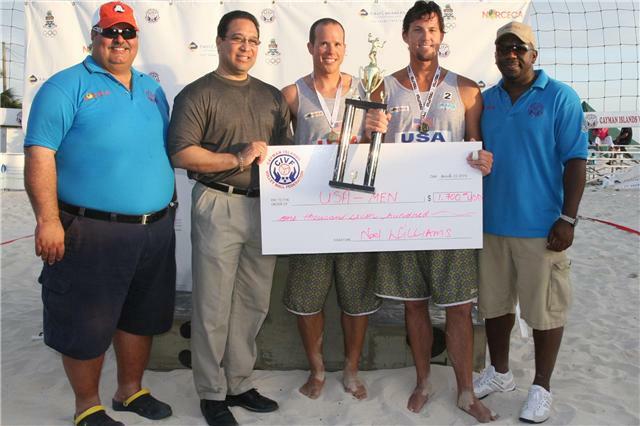 GRAND CAYMAN, Cayman Islands, March 29, 2009.- The USA-1 Team of Jason Wight and Michael Bruning came out victorious in the match for the gold medal of the Cayman Islands Beach Volleyball Tournament, the first leg of the Norceca Circuit, before a crowd of around 1,500 fans. GRAND CAYMAN, Cayman Islands, March 29, 2009.- The power of Cuba was the key in the first women�s final of the 2009 Norceca Beach Volleyball Circuit. The Cuban islanders dominated the resilient Mexicans in the match played before a full capacity facility at Seven Miles Beach. GRAND CAYMAN, Cayman Islands, March 29, 2009.- The Beach Volleyball Tournament in Cayman Islands, the first leg of the 2009 Norceca Beach Circuit, has been a complete success thanks to the work accomplished by the local organizers with their sponsors, along with moral and economical support of the official authorities of Cayman Islands. L-R: Arnaldo Sanchez, technical director, Hon. Alden McLaughlin, Minister of Sports, Noel Williams, President of Cayman Islands Federation, Mr. Alfonso Wright and Honorable Kirk Tibbetts, First Leader of Government Business. 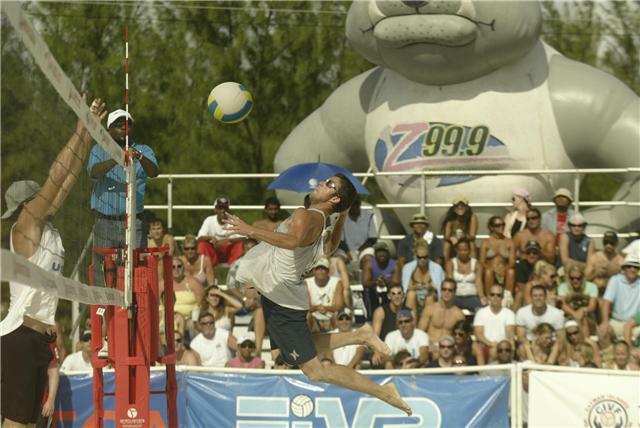 GRAND CAYMAN, Cayman Islands, March 29, 2009.- Men� teams of USA-1, Cuba, Canada and Puerto Rico are the semi finalists of the Cayman Islands Beach Volleyball Tournament, the inaugural event of the 2009 Norceca Circuit. On Sunday, USA-1 plays against Canada while Cuba meets Puerto Rico. 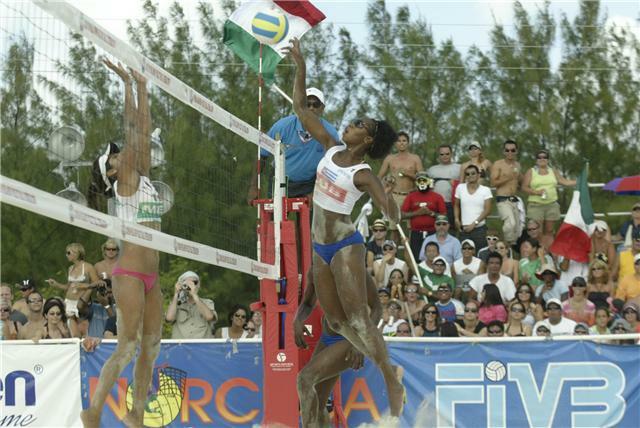 GRAND CAYMAN, Cayman Islands, March 28, 2009.- The teams of Mexico, Cuba, USA-1 and Guatemala advanced to the semi finals of the Cayman Islands Beach Volleyball Tournament, the first leg of the 2009 Norceca Circuit. The Sunday�s semi finals feature Mexico vs. USA-1 and Cuba vs. Guatemala. Mexicans Vanessa Virgen-Polet Cruz and Cubans Nirian Silial-Kirenia Ballar made it through the winners� bracket winning their two matches on Saturday. GRAND CAYMAN, Cayman Islands, March 27, 2009.- The American women�s team of Kristen Batt and Megan Wallin was perfect in three outings during their participation of the Cayman Islands Beach Volleyball Tournament. Batt-Wallin won Pool C of the competition first defeating the Cayman Islands� pair of Wanda Brenton-Jennifer Bily 21-15, 21-11, then rolling over Jamaicans Cherine Richards-Cheryl Daley 21-4, 21-6, and capping their performance with a 21-11, 21-14 victory over Costa Ricans Betsy Cruz-Marcela Mora. 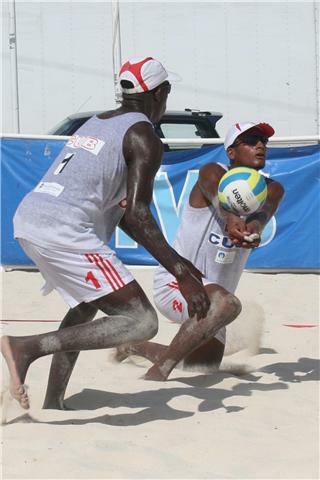 GRAND CAYMAN, Cayman Islands, March 27, 2009.- The team Cuba�s men of Sergio Gonzalez and Karell Pe�a won its three matches in Pool C during the opening day of the Cayman Islands Beach Volleyball Tournament, the first stop of the Norceca Circuit. Puerto Ricans Orlando Irizarry-Roberto Gonz�lez took first place in Pool A by winning two matches as also did Canadians Ahren Cadieux-Richard Van Huizen in Pool B. 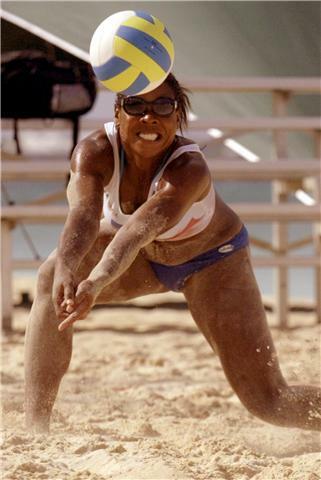 GRAND CAYMAN, Cayman Islands, March 26, 2009.- The action of the first stage of the Third Norceca Continental Beach Volleyball Circuit starts on Friday at 9:00 a.m. (local time) with the top ranked teams in both genders on the sands of Seven Miles Beach. 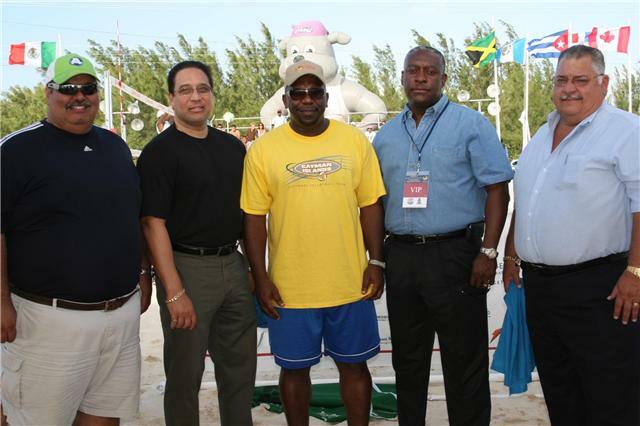 GRAND CAYMAN, Cayman Islands, March 26, 2009.- The pairs participating in the first stop of the Third Norceca Continental Beach Volleyball Circuit arrived in this warm caribbean island with plenty enthusiasm for the event that kicks off next Friday. During the afternoon and evening hours the representatives of United States, Canada, Puerto Rico, Jamaica, Trinidad & Tobago, Guatemala, Mexico, Dominican Republic and Cuba were arriving.